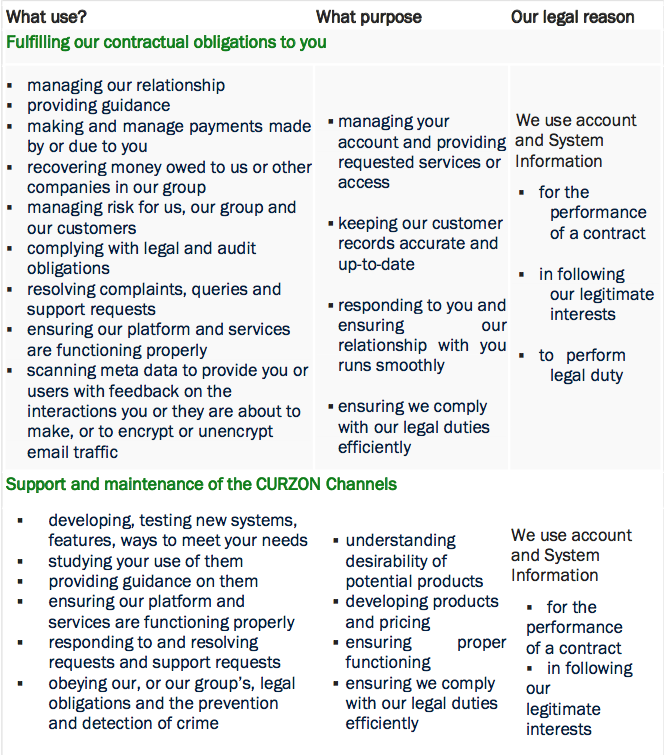 Other policies or terms and conditions may apply to you, please check all the terms and conditions relevant to your usage of the CURZON Channels or other good and services we offer you. When you register we collect information on you if you choose to register, to create an account, to become a CURZON Member or receive ongoing updates from CURZON (e.g. newsletter). The registration process identifies the fields mandatory for your registration, they represent the minimum information needed; you may fill the other fields at your discretion. c) the websites and applications which you access; and d) your usage by access time, frequency and location. We do not intentionally collect any sensitive personal information via the CURZON Channels unless it is required to do so, for example, for recruitment purposes. Please do not send or share information revealing your racial or ethnic origin; political opinions; religious or philosophical beliefs. browsing experience (e.g. avoiding having to re-enter information typed in a previous page or improve the display of our websites). 1. Essential/Strictly Necessary cookies for the functioning of our websites (e.g. facilitating bookings or remembering your log-in details). 2. Performance and design cookies to measure how many times a page has been visited, what device was used, whether a page has been visited through an advertisement or by other means. We use Google Analytics that resorts to cookies to analyse your use of our websites. Google will store, use, and evaluate the information to compile reports on the activity generated by our websites. 3. Functionality cookies to remember your settings, which you may have selected, or assist with other functionality when you browse and use our websites. This helps us to remember what you have selected, so on your return visit we remember your preferences. 4.Targeting and Tracking Cookies to help us understand your interests as you browse the internet, so we can tailor and deliver to you a more personalised service in the future. This assists us in delivering relevant advertising to you during various advertising campaigns we may run from time to time through participating third party sites. We may occasionally advertise on third party web sites. As part of our effort to track the success of our advertising campaigns, we may at times use a visitor identification technology such as "web beacons," or "action tags," which count visitors who have come to our websites after being exposed to a banner ad on a third party site. We do not use this technology to access your personal information and it is only used to compile aggregated statistics about visitors to gauge the effectiveness of our ads. By navigating on our websites, you agree that we can place cookies and web beacons on your computer or device. If you prefer not to, then you should stop using our websites, or consult your browsing settings. relevant. Please ensure that the title of your email is “Correcting my information”. 5) How can you unsubscribe? Please note that these terms, their subject matter and formation (and any non- contractual disputes or claims) are governed by the laws of England and Wales. We both agree that the courts of England and Wales will have exclusive jurisdiction.